00:45:00 Makes 4 servings, 3/4 cup (175 mL) each. Makes 4 servings, 3/4 cup (175 mL) each. 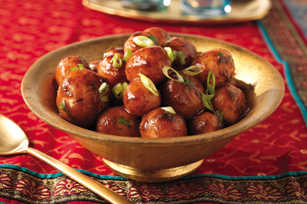 Our delicious spicy potatoes have a tangy edge from KRAFT Catalina dressing and tamarind. Cook potatoes in 1 L boiling water in skillet 15 to 18 min. or until tender; drain in colander. Wipe skillet with paper towels. Combine tamarind paste, 1/2 cup water and dressing. Mix 1/2 tsp. each garam masala, ground coriander, cumin and fenugreek, and 1/4 tsp. chili powder. Add to dressing mixture; mix well. Heat oil in large skillet on medium-high heat; stir in remaining seasonings. Add potatoes; cook and stir 2 to 3 min. or until evenly coated with seasonings. Add tamarind mixture; cook and stir 2 to 3 min. or until bubbly. Remove from heat. Gently stir in fresh coriander. Top wtih onions. Prepare using red potatoes, cut into 1-inch chunks. Serve with Creamy Chicken Korma. Serving Size Makes 4 servings, 3/4 cup (175 mL) each.